The NJHS program is a major program in the junior high school of Sacred Heart. The students strive to make it to membership in NJHS and achieve their goals in order to prepare for high school and to continue that excellence. Ms. Tague is the advisor for the program and feels very strongly about the program’s importance and emphasizes that she strives to make sure these students are prepared for the future and really emphasizes to them what the organization means and how important it truly is. This year the new NJHS group has a lot on their plates, including adopt a highway, volunteer for the animal shelter, the open door, salvation army, child safety, and the turkey trot. The induction ceremony takes place at the same time as the NHS group all at once. Ms. Tague explains that she is super excited for this upcoming group and strives to encourage her students with the right mindsets and manners to carry them on to high school. The NJHS program really is, in a way, a beginner’s step to the real journey in the high school days to continue that same excellence and go on to the NHS program. The fundraising activities that help provide money for activities are the annual bake sells at lunch, which are definitely a big hit because, after lunch, the kids are dying to have dessert. The second activity is El Tapatio night, in which the kids all take shifts and go bus tables or provide chips and salsa to the customers. Valentine’s Day is the final activity for NJHS; this provides opportunities for those who want to surprise their secret crushes without the receptions finding out who sent the card. The cute little flowers also can bring a smile to that woman who does everything and anything for you- your mom. NJHS consists of 17 bright young men and woman. Splitting the group up into six freshman members who will be shadowed by 11 8th graders. Kiley Beykirch is the president and the treasurer is by Donovan Dobson. The secretary is Arly Ponce, who runs the communications and promotions for NJHS. Claire Smeltzer is the hospitality director for the glacier breaker and fall trip. 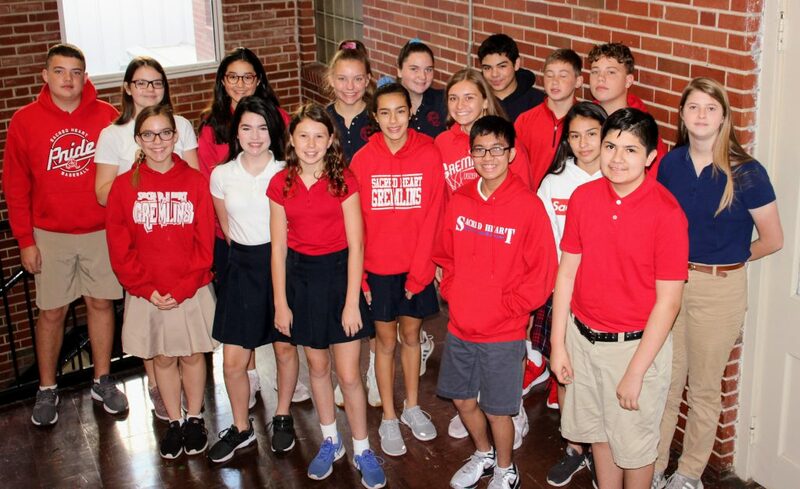 This young group of students is thriving each and every day through meetings and activities to make themselves better and to be an example for what Sacred Heart teaches each one of these bright young minds who walk through those front doors every day. “Excellence is not a skill; it is an attitude.”- Ralph Marston. This is the quote that Ms. Tague uses to emphasize to all the kids who come and go in the National Juniors Honor Society.